News in overnight from Raymond Young at RJC Yachts that he's listed the 24.3m cockpit motor Crescendo for sale. Built by Ocean Alexander in 2008, her layout is well thought out to include a full-beam saloon and master suite with high-gloss Sakura Japanese cherrywood joinery and granite throughout, along with a forward VIP stateroom and midship twin cabin. Accessed from either the aft deck or forward deck companionway with full helm station, the flybridge features a large settee, grill, wet bar and Jacuzzi with ample room for entertaining. 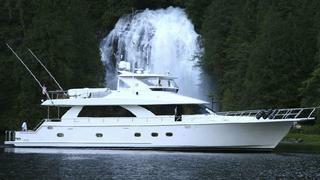 This Ed Monk designed vessel is fuel efficient and handles well for her size, powered by twin MTU 10V 2000 engines. On show at the RJC Yachts display on Pier 66 at FLIBS, Crescendo is asking $2,795,000.